Why is this book so problematic to the US of A? Why is a child, a young teen, in is angst quest to find himself, to enjoy the fact of being alive and find a porpoise to his existence free (as much as possible) of social pressure be a revolutionary idea so disrupting the book had to be censored? On the other side, the book depicts to some superficial extent, NYC during the fifties and its proverbial dialect quite good. The story itself isn’t very interesting, though it ca keep you quite hooked since you can hog page after page. What’s good here, is to somehow revisit the angst, anger and some melancholy every single one of us went through. Other than that, it’s a cool book one should read, but not to be included on top priorities. It is to me, quite over-hyped. O grande clássico da casa! I know i already said this in the graveyard book but this book actually touched parts of my heart that i thought only i can feel. I felt his loneliness, i felt the hatred, i felt how much he doesnt want to show that he truly cares. I cried during the times he’s with his sister. I adore their relationship. He probably didnt know it, but his sister means everything to him and having a sister and a brother is life changing. The love for your siblings will always be greater than of those for your parents. Ive read reviews where they say Haulden is whiny and he just complained a lot but the thing is, he is broken. After losing Allie he became really depressed and being in the that same situation as him (when i lost my grandpa, i spiraled into depression too) i know how lonely and painful it can get a lot of times. You sort of convert your pain into hate. Hatred of everyone expect the ones that you love. I can relate to him on a very deep and personal level. Heck im in my late 20’s but damn. He’s immature and funny most of the times but it’s what’s inside of him that hits me the most. As a teacher, I believe that re-reading is essential to be able to get the most well-rounded effect from a novel. 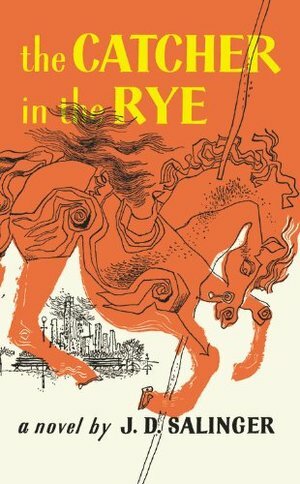 I read The Catcher in the Rye, and originally I didn’t know how beneficial the re-reading of this novel would be until I found new research about J.D. Salinger’s time in the war. J.D. Salinger spent time within World War II on the beaches of Normandy and liberating concentration camps. With this outlook every symbol I have ever analyzed and divulged into changed. The symbolism of losing innocence and childhood relates to the author, the ideas of “phony” changed. As a reader, we should detach ourselves from the author and not think that the narrator is always a reflection of the author. Yet I am having trouble thinking that WWII would have no effect on a person. J.D. Salinger wrote this book simultaneously while witnessing the war and its cruelties. With this new information, I think that high schoolers--usually eleventh graders will understand more fully the reasons behind Holden Caulfield.I think this creates more of a background story for students to understand the psychological projection of the war through Holden Caulfield. The ducks leaving as a sense of liberation, the epiphanies of evil in the world and how it affects all of us. I think through these new discoveries I will be able to help students understand more of the symbolism through different avenues and make it easier to wrap one's mind around the phonies Holden addresses. What can I say about this book? I had no expectations at all. What I really like is that is really "flowy", it flows soooo easily. Maybe it is because it is written as if the narrator, Holden, was just speaking directly to the reader, a pretty long but interesting chat. It kills me!